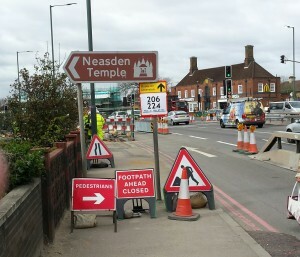 On a grey, blustery and rainy day, walking along a North Circular flyover feels like a trek to the ends of the earth – only rather more crowded, especially with road works. I was there in search of a piece of transcendentalism, a traditional Hindu temple, in its marble and limestone glory, in the middle of a north London housing estate. 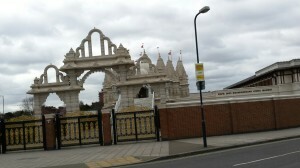 Neasden Temple the sign said, though we had to weave through bollards and wire fencing to get to the road we needed. Then a walk along a residential street, terraced houses, front gardens concreted over and trees lining one side, quiet now, thankfully, after the incessant roar of traffic. It was raining with the fine, clinging rain which soaks you before you realise it, though at least there were no longer any lorry fumes. Then just ahead, sitting between the 1930s housing stock and the 1960s low-rise tower blocks was a marvel in carved white stone. So alien did it appear that it seemed to have been flown in, complete, from some other dimension. The BAPS Shri Swaminarayan Mandir and associated buildings were so stunningly ‘out of place’ it made one re-examine the phrase. This fantastic complex is a remarkable example of what can be done if the will is there. Hand-carved in India before being transported and re-assembled in London in just two and a half years, it is the biggest Hindu temple in the UK and gets over half a million visitors a year. My experience and knowledge of Hinduism is limited. I’ve read the Ramayana and the Upanishads, in the same way that I’ve read the Greek myths or the Bible, as pieces of great literature with huge cultural significance, and as documents of faith to millions. But, a few prosaic conversations with the local Hari Krishna man aside, that’s it. I’ve certainly never visited a Mandir. This one was spectacular. Its central marble dome was decorated with carved seated musicians around the edge beneath dancing figures, all surrounded with lacy leaves and other natural forms. 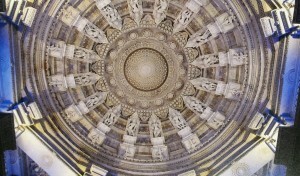 At its apex, where the oculus would often be in the western architectural tradition, was an immense suspended sculpture in a flower shape, with layers of petals peeling back from a central lotus ( or at least that’s what it looked like to me ). Floor, walls and columns were all of Italian marble, the last two heavily incised with exquisite carvings, of figures, natural forms and patterns. Elaborate but delicate arches hang between the columns receding one after the other to give a sense of measured perspective. Around the sides of the room, the inner sanctum, are seven ornate shrines, each housing murtis ( sacred images ) of Hindu Deities each image is believed to hold the presence of the God. When I visited there were individual devotees genuflecting and praying, though the Mandir filled for the Arti ritual, the ceremony of lights at 11.45. We were made very welcome ( though not by the marble floor – it’s a long time since I’ve sat on something so hard ). 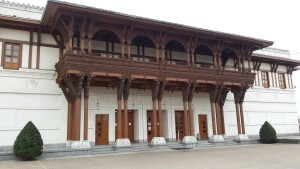 Then to collect our footware and admire the remarkable carving on the teak columns and balconies of the Haveli, housing an assembly hall, social space and gymnasium ( special planning permission had to be given to allow the construction of the wooden interior by traditional means ). Outside there are knot-gardens, filled with Spring bulbs, but it wasn’t the day to appreciate them. We headed over to the restaurant. The temple is open to the public from 9 a.m. to 6 p.m. daily. There is no charge, though there are certain requirements as regards dress ( check the web-site ). No photographs are permitted inside ( these images are from purchased photographs ). Nice Julie. As it happens I was wandering in Glasgow’s west end on Thursday and came upon a Gurudwara (Sikh temple) nearing completion. Loved its large ‘One God’ inscription on one of the columns and, that it was standing side by side with Glasgow’s old Tron church. It’s interesting how and where houses of religion are situated. The Mandir was just placed there, looking ‘out of place’, the Glasgow Sikh temple is being built next to a old church and, the friend who accompanied me to the Mandir told me, a synagogue near her house in north London actually occupies an old church. But the building was listed so the church accoutrements are still there, behind newly constructed synagogue walls. An altar and a bimah in the same place.